Today is the last day to apply against 233 vacancies in DRDO! Engineering graduates can apply for the posts at the official portal. Find detailed information here. 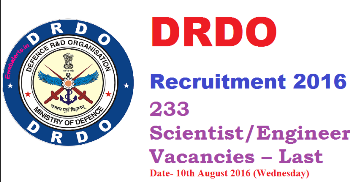 DRDO had notified of 233 vacancies through official advertisement (Advt no. 120). Vacancies are available in the post of Scientist/Engineer ‘B’ in various Disciplines. DRDO invites applications are from Indian nationals only with at least First Class Bachelor’s Degree in the relevant discipline. Knowledge of German, French, Russian, Japanese or Chinese is desirable. Candidates must also be less than 28 years. Age relaxations are available as per government norms and regulations. Candidates are required to submit their applications online along with legible and lighter file containing scanned copies of essential documents and application fee of Rs 100 (there is no application fees for SC/ST /PWD and women candidates). DRDO has prescribed two selection procedures. For Part I posts candidates will be selected on the basis of valid GATE score of GATE 2015/2016, in the ratio of 1:5 subject to their availability in order of the discipline wise category wise merit list. The GATE paper and the subject of qualifying degree must be related to the Subject/Disciplines against which the candidate is applying. For Part II posts, screening will be on the basis of percentage of marks obtained in Essential Qualification, in order of the discipline wise category wise merit list. Shortlisted candidates will have to appear in the personal interview to be held at Delhi/ Bangalore/ Hyderabad/ Pune or any other place as decided by RAC/ DRDO. The personal interview is likely to be held in the month of August-September 2016.